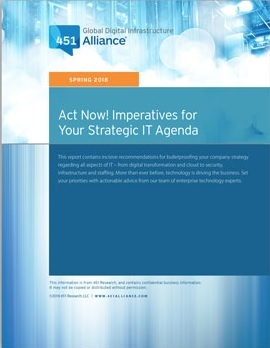 The 451 Alliance is a community of IT professionals, tech executives, and tech-adjacent professionals who have banded together for a common purpose: to be heard. This member-driven think tank tracks changes in corporate IT, digital infrastructure, and emerging technologies well in advance of other sources. Members gain access to research and best practices in their core areas of expertise in exchange for providing their insights in occasional surveys. Convenient bi-weekly digest of can't-miss IT trends, along with member benefit updates and fresh discount offers from our partners. Membership is complimentary – there are never any fees to join or renew. You've previously applied to join the 451 Alliance. Please visit www.451alliance.com to log in to your account or use the Forgot Password link. Do you consent for the 451 Alliance to send you communications and/or utilize your information as specified? Yes please, I'd like to receive communications. No, I do not authorize you to contact me about any topics or utilize any of my information for the services above. GDIA News - GDIA's monthly Newsletter that covers updates, new client and staff profiles, new learning resources and more. Upcoming GDIA events and webinars - Be notified of upcoming GDIA events and webinars. New and updated learning materials - Receive updates about new learning materials, "how-to" instructions and other educational information.